Iran is unlikely to allow any inspections of its military sites by the International Atomic Energy Agency (IAEA), if only because such inspections were not part of the 2015 accord. The Trump Administration is simply trying use the IAEA as another means to put pressure on Iran. Although Iran has expressed confidence that the IAEA wont succumb to U.S. demands, we are not so sure. The U.S. could easily use its power and influence to sway the IAEA into making decisions in line with U.S. policy on Iran. Moreover, we would not be surprised if this issue doesn’t drag on to become a major point of contention. With the U.S. demanding that the IAEA carry out inspections of Iran’s military sites and Tehran adamantly refusing. Ed. The Trump administration is insisting that the International Atomic Energy Agency (IAEA) start inspect Iranian military sites where the Islamist regime is suspected of having conducted nuclear weapons-related work. U.N. ambassador Nikki Haley visited IAEA headquarters in Vienna, Austria, on Wednesday, where she discussed the Iranian nuclear program with IAEA head Yukiya Amano. The trip could be seen as part of the ongoing policy review by the Trump administration regarding Iran’s nuclear program, its compliance with the nuclear deal brokered by the Obama administration and its bellicose imperialistic activities in the Middle East and beyond. It was not surprising that during the talks with the U.N. nuclear watchdog organization, Haley brought up Iran’s full compliance with the Joint Comprehensive Plan of Action (JCPOA), the 2015 nuclear agreement between the Islamic republic and multiple world powers. Haley said she received some good answers from her counterparts at the atomic agency, but also asked the IAEA whether it is prepared to conduct inspections at Iran’s military sites, citing concerns about covert Iranian actions related to the Iranian nuclear program at these bases. 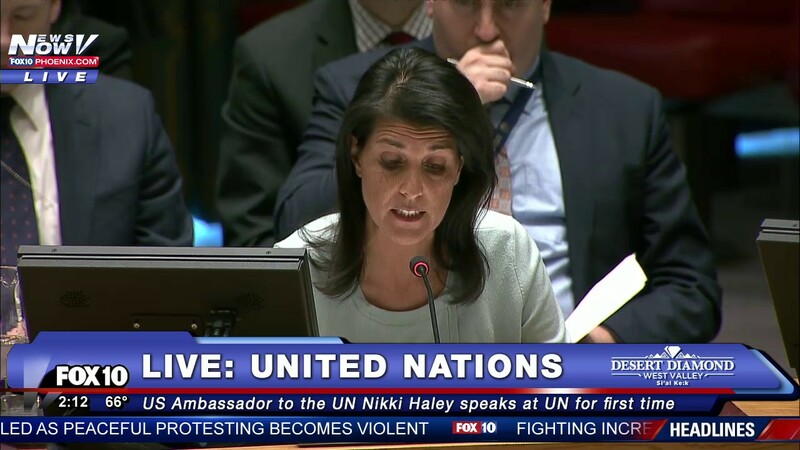 “If you look … at past Iranian behaviour, what you’ve seen is there have been covert actions at military sites, at universities, things like that,” Haley told Reuters. “There were already issues in those locations, so are they including that in what they look at to make sure that those issues no longer remain?” Haley said, referring to IAEA inspections at the military base of Parchin, where Iran is suspected of having conducted tests with detonators for nuclear warheads. “They have the authority to look at any suspicious sites now. It’s just are they doing it?” Haley asked. The Islamist regime in Tehran is vehemently opposed to IAEA inspections at its military sites and accuses the United States of sabotaging the JCPOA and sowing doubt among the nations that negotiated the agreement. Iranian Foreign Minister Mohammad Javad Sharif complained Haley’s pressure on the IAEA “flies in the face” of the nuclear agreement and suggested that the U.S. actions could hamper the successful implementation of the JCPOA. “Even before the visit takes place, the way it is planned and publicized and the signal that it sends have notable detrimental consequences for the successful implementation of the JCPOA,” Zarif wrote in a letter to the European Union and the IAEA, in which he called the U.S. pressure “mala fide”. “This is another example of ‘mala fide’ on the part of the U.S. government, with the aim of limiting Iran’s benefits from the deal; a constant practice of various agencies and instrumentalities of the United States … which has continued to be exacerbated even in a more grave and manifest manner during the current administration,” Sharif said. “Regrettably, this visit … is widely perceived by the international community as a manifest and blatant attempt by (Haley) — openly hostile to the JCPOA and determined to undermine and destroy it — to put pressure on the Agency and adversely affect the professional and impartial nature of the work of the IAEA,” Zarif concluded. Zarif’s action came after several high-ranking Iranian officials threatened to leave the JCPOA over Trump’s new policy toward the agreement, which the president has called the worst deal he’s ever seen. The spat over Haley’s visit to Vienna illustrates the rapidly deteriorating relations between Iran and the United States since Trump was inaugurated in January. The tensions between Tehran and the United States have not gone unnoticed in Middle Eastern capitals, where many think that Trump will eventually take military action against the Islamic Republic. Iraqi Prime Minister Haider al-Abadi has already made it clear that the U.S. military cannot use Iraq as a starting point for a war with Iran. “Iraq is not a starting point for attacking other countries. If there are clashes between Iran and the United States, then we will not allow the U.S. to take advantage of us,” Abadi, said while emphasizing that Iraq is an independent country and has its own interests.